Must be the year of the novella. I started the year with three short works in three days, and it seems to have rolled on nicely from there, with several more books of less than 150 pages read to date. Of course, my new, lazier blogging regime has had a little to do with that. Last year, when I was typing out a full review for every book I read, reading this many novellas would have resulted in the little-known medical condition of Sensory Post Overload Tension Syndrome (SPOTS) as I struggled feverishly to review each one in the style it craved and deserved. believe me, it’s not pretty. Anyway, here are some choice thoughts about two slight works by a couple of wonderful writers. Short ones, of course. 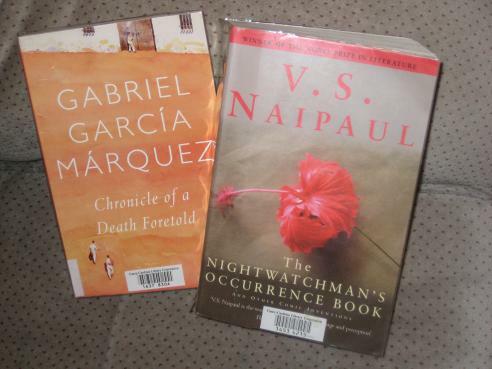 Gabriel Garcia Marquez’ Chronicle of a Death Foretold (translated into English by Gregory Rabassa) is apparently a reconstruction of an event from the writer’s youth and recounts the death of Santiago Nasar, victim of an ‘honour killing’ in a small Colombian town. The reader knows Nasar’s fate right from the start, and it’s only a few pages until we know who carried out the murder – and the reason for it. The beauty of this novella is not in the who and what, but in the how and why, and the way the author unwraps his story, layer by layer, like a beautifully wrapped Christmas present, is a joy to behold. The journalistic approach adopted by the writer reminds me of Heinrich Böll’s Die Verlorene Ehre der Katharina Blum, but where Böll’s work was taut, aggressive and detached, GGM is an integral part of the mazy, rambling story, one of the many extras roaming the streets (and slipping in and out of bed with the madam of the local brothel, not something you often find chroniclers doing). The story slips back and forth in time, meandering occasionally, before being gently guided back into the semblance of a linear tale. Great care is taken with painting the people populating the story, to the extent of adding interesting details about the most minor of characters (such as a policemen who we learn “…died the following year, gored in the jugular vein by a bull during the national holidays.”). In fact, the victim himself seems to be less important than the host of bystanders who look on guiltily or try to find the unfortunate Santiago to warn him of his fate. You see, by the time of the murder, virtually everyone in the town knows that it is going to happen, with the notable exception of the victim. His murderers, damned to avenge their sister’s honour, but hopeful that someone may still prevent them from doing it, tell all and sundry of their intentions. Santiago’s friends scour the streets, trying to find him and warn him before it’s too late; the police and the priest are informed and several steps are taken to prevent the tragedy from taking place. As we know from page one of the book, somehow they are all unsuccessful. The wonderful people at the library had also decided to stock up on V.S. Naipaul, and this book would have been worth purchasing. The Nightwatchman’s Occurrence Book and Other Comic Inventions is an omnibus containing a collection of short stories and two novellas: The Suffrage of Elvira (which I read last month) and Mr. Stone and the Knights Companion. This novella started off as a short story but eventually became too long and was published in its own right, and, for the first half at least, it seemed like a concept extended beyond its natural life. The idea appeared a little drawn out, and I had trouble seeing where the story was going. Eventually though, as Stone stops fighting against the unfairness in the world and the appropriation of his ideas at work, he starts to regain his equilibrium and seeks comfort in the natural world, his garden and the once-hated cat from next door. This sketching of the inner life of an elderly gentleman is one of Naipaul’s strengths. Just as he does in A House for Mr. Biswas, here he draws out the inner dignity of a powerless man, surrounded by women at home and eclipsed by pushier, more cunning colleagues in the work environment. Hi, I found you on my friend's wonderful blog Meredith ( Bellezza ) and added you to my blogroll. I have “A BEND IN THE RIVER” and “MAGIC SEED” by V S Naipaul but have not read either one yet. I also have a few of G G Marquez, read and not read. You made me curious to read V.S. Naipaul. Chronicle of a Death Foretold – I read the book, watched the film and loved them both! I haven't read anything else by Marquez but friends have recommended Love in the Time of Cholera. I've read several of Naipaul's books which I liked (mainly because my dad's a fan) but not this one. Naipaul himself sounds difficult, but his prose isn't.